Rebecca Solnit has made a vocation of journeying into difficult territory and reporting back, as an environmentalist, antiglobalization activist, and public intellectual. Storming the Gates of Paradise, an anthology of her essential essays from the past ten years, takes the reader from the Pyrenees to the U.S.--Mexican border, from San Francisco to London, from open sky to the deepest mines, and from the antislavery struggles of two hundred years ago to today’s street protests. The nearly forty essays collected here comprise a unique guidebook to the American landscape after the millennium—not just the deserts, skies, gardens, and wilderness areas that have long made up Solnit’s subject matter, but the social landscape of democracy and repression, of borders, ruins, and protests. She ventures into territories as dark as prison and as sublime as a broad vista, revealing beauty in the harshest landscape and political struggle in the most apparently serene view. Her introduction sets the tone and the book’s overarching themes as she describes Thoreau, leaving the jail cell where he had been confined for refusing to pay war taxes and proceeding directly to his favorite huckleberry patch. In this way she links pleasure to politics, brilliantly demonstrating that the path to paradise has often run through prison. 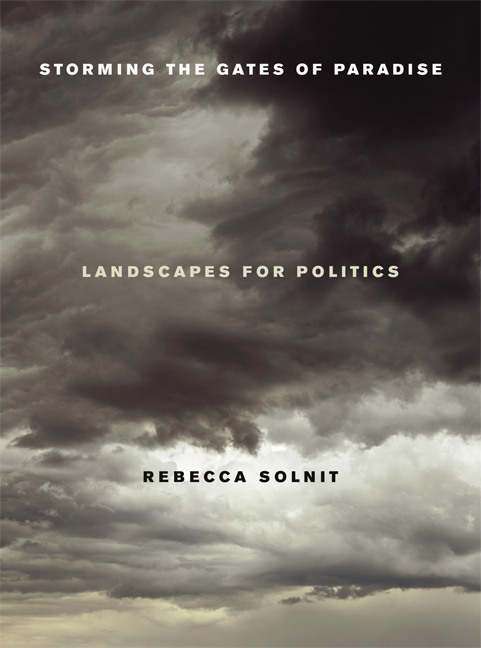 These startling insights on current affairs, politics, culture, and history, always expressed in Solnit’s pellucid and graceful prose, constantly revise our views of the otherwise ordinary and familiar. Illustrated throughout, Storming the Gates of Paradise represents recent developments in Solnit’s thinking and offers the reader a panoramic world view enriched by her characteristically provocative, inspiring, and hopeful observations. Rebecca Solnit is the best-selling author of ten books – among them Wanderlust, Savage Dreams, and Hollow City – and countless articles, for which she has received numerous awards and accolades. In 2003 she won the prestigious Lannan Literary Award. Also in 2003 she won the National Book Critics Circle Award for River of Shadows.